Lieutenant Colonel Monique C. Graham is the commander of the 55th Force Support Squadron, Offutt Air Force Base, Nebraska. She oversees over 70 facilities and 600 employees, with an Appropriated Fund budget of $20M annually and Nonappropriated Fund revenue exceeding $8M annually. She is responsible for providing vital mission support through manpower and personnel, services sustainment, force development, Airman and family services, community services along with mortuary affairs, honor guard and installation readiness. The Force Support Squadron supports more than 57,000 military, civilian, family members, and retirees, plus 50 associate units including United States Strategic Command and the 557th Weather Wing. She is a career Force Support Officer with experience as Military Personnel Flight Chief, Section Commander, Chief of Officer Assignments, Liaison for Personnel Programs and Officer Assignments, Manpower Analyst, Squadron Operations Officer, Deputy and Commander. Mr. Thomas C. Fahrer is the Deputy Director of the 55th Force Support Squadron, Offutt Air Force Base (AFB), Nebraska. Along with the Commander, he oversees a squadron comprised of 70 facilities and 550 employees with an Appropriated Fund budget of $20M annually and Nonappropriated Fund revenues exceeding $8M annually. Offutt’s Force Support activities include a 220K SF Fitness Center; 18-Hole Golf Course with Pro Shop and Restaurant; Collocated Club; 210-Room Lodging operation, 2 large Child Development Centers, a Youth Center operation; Outdoor Recreation with two RV Storage Lots, Base Lake Marina and Family Camping operations; Auto Hobby Shop; Frame & Design; Aero Club; Resource Management section; APF and NAF Civilian Personnel Offices; Airman & Family Readiness Center; Marketing Office and more. Mr. Fahrer entered federal service in October 1982 after earning a Bachelor of Arts Degree from Bellevue University, Bellevue, Nebraska. 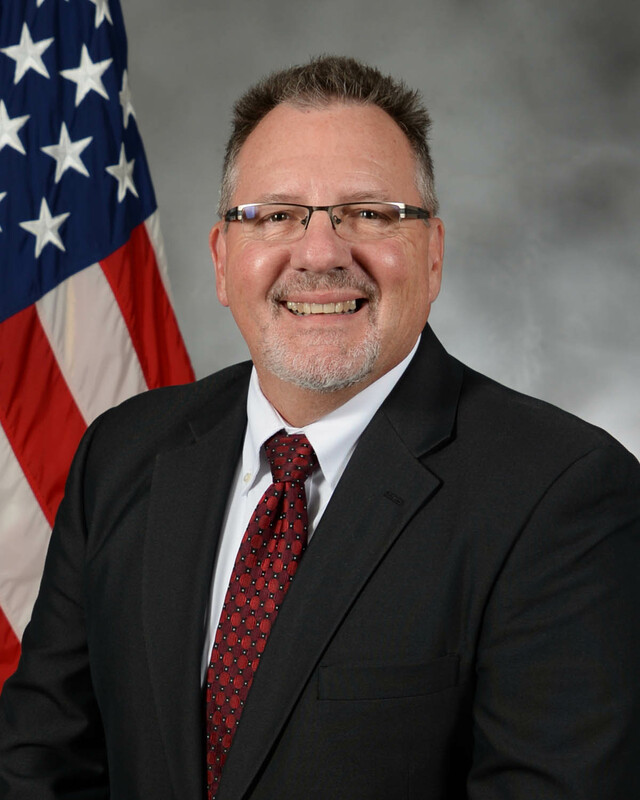 He is a career Force Support professional who has served as the Director of Services at Arnold AFB, Tennessee and the Deputy Director of Services at Offutt AFB, Nebraska, F. E. Warren AFB, Wyoming and at Spangdahlem Air Base (AB), Germany. He also served as a staff officer for the MWR Directorate, Strategic Air Command, Offutt AFB, Nebraska. Major Laura Glass is the Operations Officer for the 55th Force Support Squadron, Offutt Air Force Base, Nebraska. She is responsible for providing vital mission support through sustainment services in addition to mortuary affairs and installation readiness. The Force Support Squadron supports more than 57,000 military, civilian, family members, and retirees, plus 50 associate units including United States Strategic Command and the 557th Weather Wing. Major Glass received her Master’s degree in Elementary Education and received her commission from Reserve Officer Training Corps via West Virginia University. Her contigency experience includes two deployments in support of Operation Enduring Freedom serving as Officer in Charge of Executive Administration at a Forward Operating Base in Iraq, and as the Expeditionary Force Support Flight Commander at Kandahar Air Base in Afghanistan. Chief Master Sergeant Sharon R. Wilde is the Superintendent, 811th Force Support Squadron at the Pentagon, Washington, D.C. She is responsible to the commander for 80 employees providing work-class personnel support, professional development and continuing education opportunities, recreation services and deployment and family readiness services to over 55,000 military, civilian, retirees and dependents assigned to the White House, the Office of the Secretary of Defense, the Joint Chiefs of Staff, the Secretary of the Air Force, Headquarters Air Force and Defense Agencies, as well as over 700 Air Force leaders in the National Capital Region. Additionally, Chief Wilde is the advisor to the commander and First Sergeants in Uniform Code of Military Justice authority for a worldwide mission, enforcing discipline for 23,000 personnel. Chief Wilde represents the squadron’s highest enlisted level of leadership and, as such, provides direction for the enlisted corps and represents their interest to the squadron, group, and wing leadership. She serves as the personal advisor to the commander in all issues regarding the welfare, readiness, proper utilization, and progress of the enlisted force.Chief Wilde was born and raised in Mandaluyong, Philippines. She entered the Air Force in November of 1995 as a Personnel Specialist and has served in numerous leadership positions within Personnel career field. She has been deployed in support of Operation KENDO STREAM, ENDURING FREEDOM, IRAQI FREEDOM, NEW DAWN and JUKEBOX LOTUS. She has been stationed in Louisiana, Korea, Italy, Wyoming, Qatar, Greece and the United Kingdom. Master Sergeant Werner entered the Air Force in July 2002. He graduated from the bomber avionics apprentice course at Sheppard AFB, Texas in May 2003. His background includes various duties in aircraft maintenance including avionics technician, section chief, and production superintendent. He has also filled the role of Airman Dorm Leader at Kunsan Air Base (AB), South Korea. Prior to his current position, MSgt Werner was a First Sergeant at the 55th Communications Squadron, Offutt AFB, Neb.